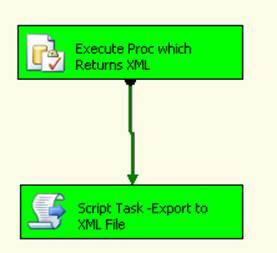 Recently I was given a task to export data in XML format using SSIS. 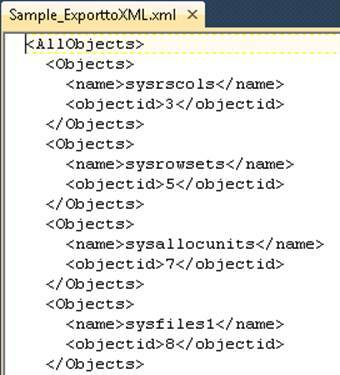 I initially thought it should be straight forward – just dump it in a flat file and give it a name xml type, however SSIS has no XML destination just an XML source. I had no luck dumping the XML in flat file. My solution was to use a script task which worked well. My requirement is that the stored procedure would return the XML as a single row and I need to export that in a file. Now the stored procedure is created, let us start with the SSIS package. 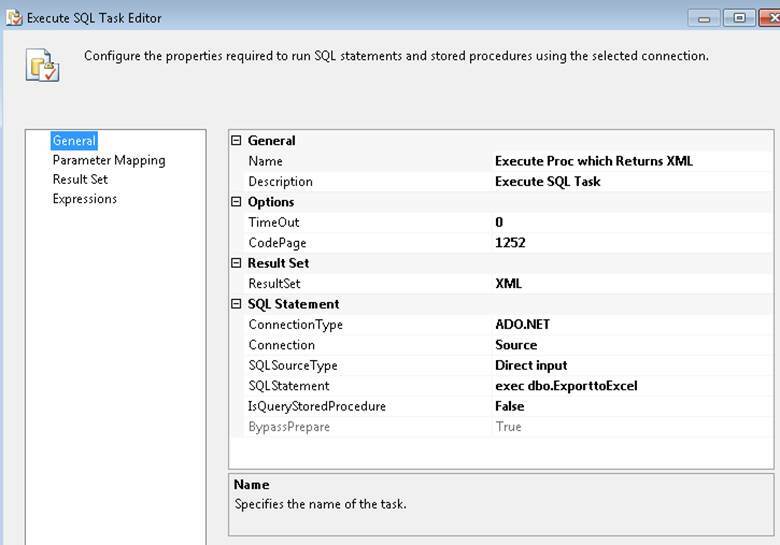 The first task is to drag and drop the Execute SQL Task. 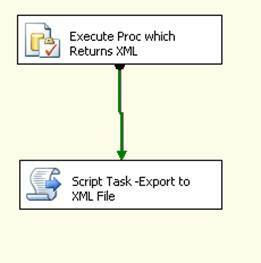 This Task will execute the stored procedure and return the result set of XML in a string variable. Note that, the Result Set will be XML, and ConnectionType will be ADO.NET. In order to return an XML result only the ADO.NET Connection Manager has to be used. Be careful while setting the parameters to your stored procedure in ADO.NET connection, as the parameter passing method is different in ADO.NET and OLEDB. In ADO.NET you need to pass the parameter as @para instead of ? FileName – If there is specific file name to be given, set it as a variable. FilePath – If the file location is also variable, this variable will be set. On the Result Set select the variable defined. Here, when we store the XML value in a string variable the XML display format changes to one single line and it no longer displays in a proper XML format. Edit the Script and go to the void main function. 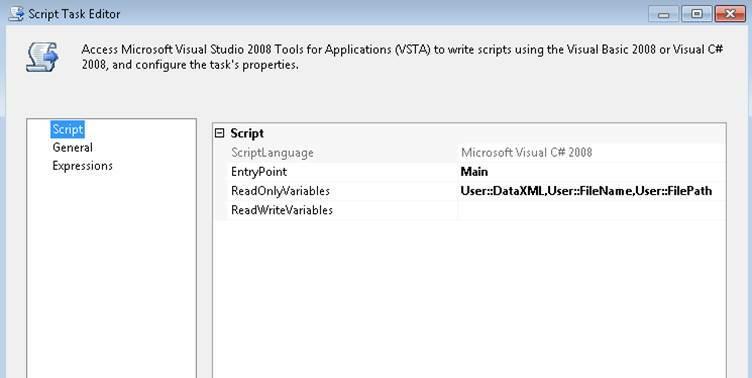 The first step in the script task, is to fetch the data from the DataXML string variable into a new variable inside the task. Since the variable is a string and we want to export to a XML file, we need to convert the string variable to an XMLDocument. Declare an xdoc XMLDocument variable, and using the LoadXML function, convert the string to XML. Put the outputfile path into another variable. Lastly, write the xdoc variable to the outputfile path. Save the script and exit. The file is now exported to the expected path. 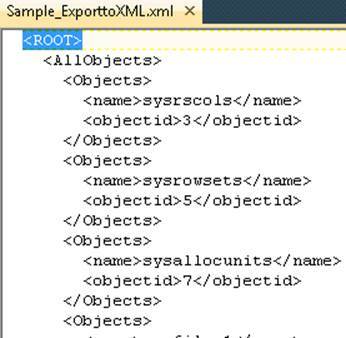 The file has a new Root tag which means when the Execute SQL tasks writes the DataXML variable with XML result set, it always adds a Root Tag. Since we don’t need the extra Root tag, we can remove it in the script task. Replace the earlier code to get xml in Data variable with the new code as below.